The Nose Jammer Scent-Control Four-Pack Combo contains Nose Jammer Shampoo and Body Wash, Deodorant, Field Spray and Gear-N-Rear Wipes. When used together, these scent-control products help eliminate odors so deer get closer and stay longer by your stand site. 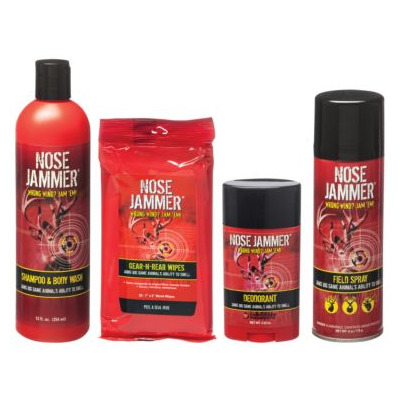 Nose Jammer products jam big-game animals' ability to smell. These products help reduce odors; does not guarantee 100% odor elimination.